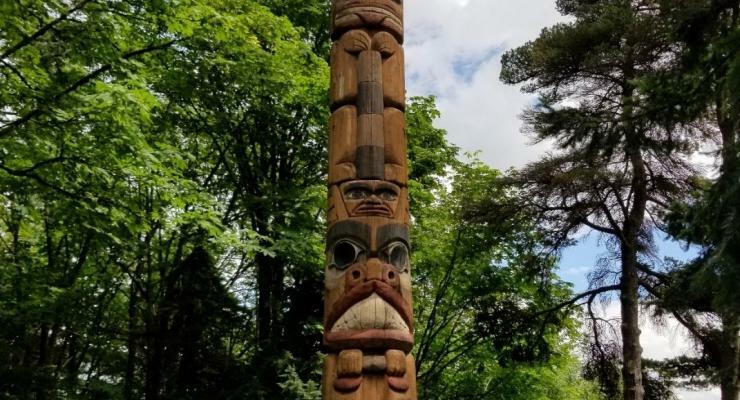 Friends of Terwilliger has contacted the Regional Arts and Culture Council (RACC) to express our concern for the Totem Pole in the Terwilliger Parkway. The Totem Pole has numerous holes inflicted by wood-boring woodpeckers and is in need of protective restoration, repainting, and care. The RACC public art “Totem Pole” is located at the Elk Point Viewpoint in the Terwilliger Parkway and was carved by Chief Lelooska in 1959. It became a partof RACC’s Public Art Program in the late 1980’s. Chief Lelooska of Ariel, Washington carved the totem pole from red cedar harvested from the base of Mt. Adams. This totem pole is one of the most massive in existence measuring fifty feet high and four feet wide. The carved figures depict a beaver surmounted by a grizzly bear next to a raven topped by four watchmen. Born Cherokee, Chief Lelooska (1933-1996) was adopted into the Kwakwaka’wakw, and was known for his mastery of storytelling and carving. As a scholar and educator, Chief Lelooska was recognized as significant resource on Native Americans in North America with a particular emphasis on the tribes of the Northwest coastal region. He was known for his versatility in wood sculpting, creating artwork that ranged in size from hand-held rattles and feast bowls to large-scale totem poles. The “Totem Pole” at Elk Point Viewpoint serves as an excellent example of Chief Lelooska’s work and is a prized part of Portland’s public art collection. In 2014 our regional government, Metro, solicited Chief Tsungani and family in Ariel, Washington when the Chief Lelooska totem pole at the Oregon Zoo was restored and relocated. Perhaps Chief Tsungani and the Chief Lelooska Foundation and Cultural Center could be a resource for the restoration of the Terwilliger Parkway totem.See below for more current photos. 100 years of providing green space in Portland. AGAIN, Your opinion is URGENTLY needed to protect Terwilliger Parkway!